Porcelain maxi-tiles push forward the new frontiers in coverings, to levels that were unthinkable until only a few years ago. It is easy for today’s designers to design the best contemporary floors and walls in complete freedom, with no restrictions on size, for all applications from architectural spaces to furniture and finishes, taking advantage of the aesthetic potential of the many effects of porcelain. With sizes such as 300x150 and 300x100 and a thickness of only a few millimetres, high-tech ceramics offer a number of important features for designers, including light weight, flexibility and ductility. 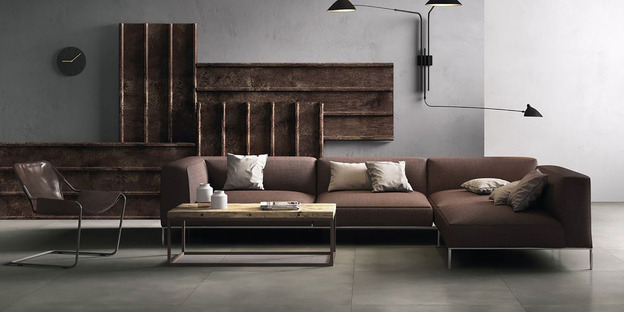 While large sizes considerably reduce the number of interruptions in the design unit, ceramic materials are also available in numerous sub-multiples to make porcelain slabs even more versatile and practical. The light weight of individual maxi-tiles is another important quality, offering obvious advantages in logistics when transporting the slabs and handling them on the construction site, and in all contexts in which slabs are laid over existing surfaces. All without giving up the mechanical resistance of high-tech porcelain, attributable to the compact nature of this unique material. GranitiFiandre, a leading maker of aesthetic high-tech ceramics, produces a number of large sizes in its Maximum line, only 6 mm thick. 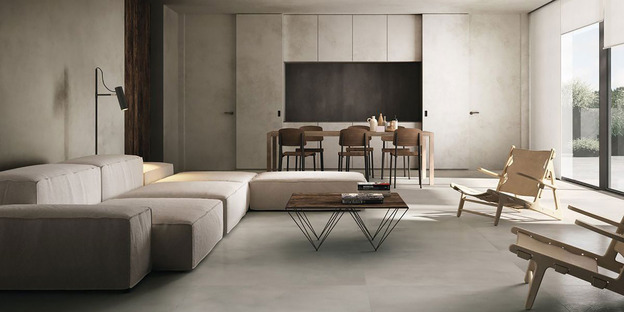 Maximum combines all the principal qualities of quality porcelain, making it perfect for a number of different applications, particularly as a floor and wall covering solution for residential and commercial use, both indoors and outdoors. One of the most innovative solutions offered by Maximum is its ability to become “an integral part of items of furniture, covering tables, dividers, cabinets, doors, ceilings, backlit walls, chairs and bathroom furnishings”. Designers can let their imaginations run wild and come up with a total look in which the coverings determine the look of surfaces. Maximum is also appropriate for covering ventilated façades, helping redefine the external walls of buildings and ensuring proper thermal insulation as well as clear aesthetic benefits. GranitiFiandre’s HQ.Resin comes in the colours White, Cinder, Grey and Dark: particularly popular neutral colours in contemporary design because of their ability to go well with either traditional or modern furniture. HQ.Resin also stands out for its surface "topped with the unique effect of tone-on-tone relief" underlining the tactile experience of surfaces. The result is a highly customised space of great appeal, where light also plays a key role in defining the mood and attraction of the interior. The light effects on surfaces create original, dynamic points of light and shadow of different intensity, revealing the aesthetic qualities of individual slabs and of the overall effect. Presented as a surface that "reinterprets the ancient fascination of stone, in which human beings have always engraved their history", Megalith Maximum shares HQ.Resin’s intense naturalness and basic colour palette expressed through five engraved hues (Megawhite, Megagreige, Megabrown, Megagrey and Megablack) designed to set the standard for all modern architecture. Megalith is available in the 100x100 cm size and in two finishes, honed and pre-polished. Maximum also has another important feature: it is the first all-porcelain product of its size to be produced with a completely polished finish.